We try to make our dogs as comfy as possible at all times. When no one is home, in order to keep the pups out of mischief (and to keep the house in one piece), we put all the dogs in their own crates. The crates have thick bedding on the bottom and have a few toys in there to keep the dogs busy. We also give them something to chew on, like a bully stick, when we leave so that they’re entertained for a while. Every now and then we have a dog that would rather chew on the bedding than the toys. We have this in Chance. So, we’re running low on bedding at the moment. 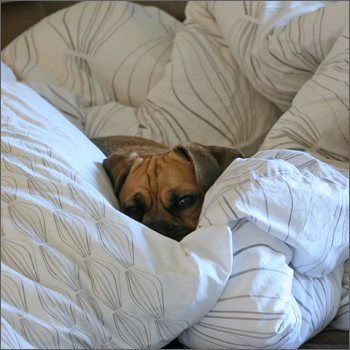 We use blankets, sheets, comforters, moving blankets, dog beds, cushions – you name it, we use it! 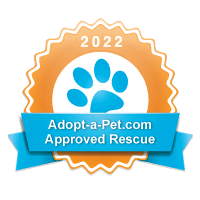 If YOU have any of these kinds of items laying around your place that you don’t use and don’t know what to do with, we’d love to take them off your hands and turn them into awesome dog beds. Please contact us at pugglesnpitties@gmail.com and we’ll coordinate their pick-up with you. Many thanks, and happy snuggling! « Pearl is a true gem!